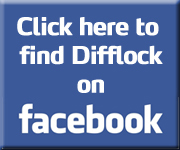 Difflock :: View topic - Veg Oil - Twin Tank Setup. Veg Oil - Twin Tank Setup. Posted: Thu Nov 01, 2007 10:51 pm Post subject: Veg Oil - Twin Tank Setup. Now to make the car suitable I am converting it to a Twin tank system. The Major Problem with veg oil is its thickness when cold, When cold it Will not inject properly and therefore won't burn properly. Whilst this is not an immediate problem there is a very real danger of unburnt oil clinging to the cylinder walls and gumming up the piston rings. The next stage from this is so much veg oil contaminates the sump oil that is causes polymerisation of the sump oil and turns it to Jelly - this is not good for the engine! Indirect Injection Diesels are much better at handling veg, Bosch Inline Injection pumps are the best - then followed by Bosch + Similar Rotary pumps. 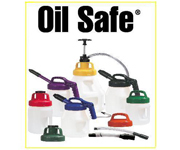 Lucas, CAV and Stanadyne are NOT suitable for use unmodified with cold veg oil. YES your Landrover TDI has a Bosch rotary pump and YES you will kill it with cold veg eventually. The way around all these problems is to Twin tank. 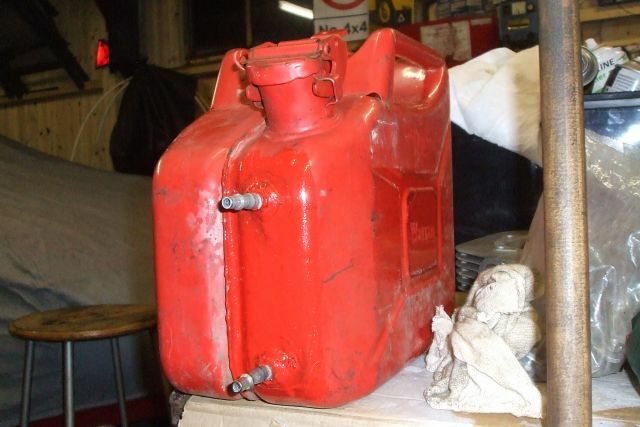 The Theory is you Fit a 2nd fuel tank to the boot of the car, usually just a small one of 10l or so, this is used for cold starting of the engine and warming up, once the engine is warm the fuel is switched over by using an electric 6 port changeover valve - this directs the return lines to the correct tanks. The Veg line usually runs through a heated fuel filter and a Coolant/oil heat exchanger before entering the injection pump, The oil needs to be at least 70*C to get it as thin as Diesel. Then a mile before stopping for a long period, the engine is switched back to Dino Diesel ready for the next cold start. 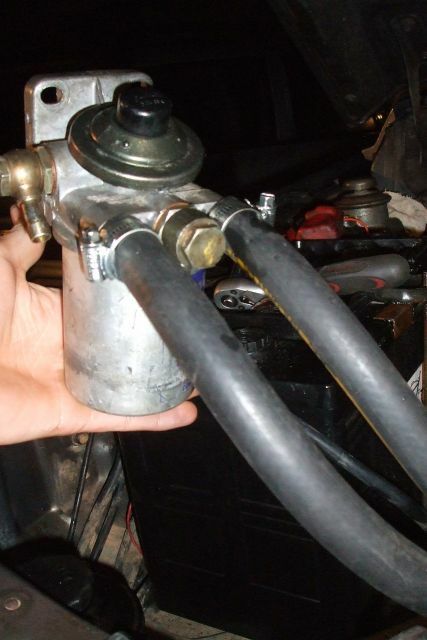 Adding hot veg to a cold fuel pump is no good as all heat will be lost instantly. Glow plug heaters are woefully ineffective. Someody did a rough calculation - the heat needed to effectively heat the fuel supply into the pump is pushing 2000w, a glow plug is 100W. You'd need TWENTY glow plugs to work it properly - this would be a current draw of 200amps!! 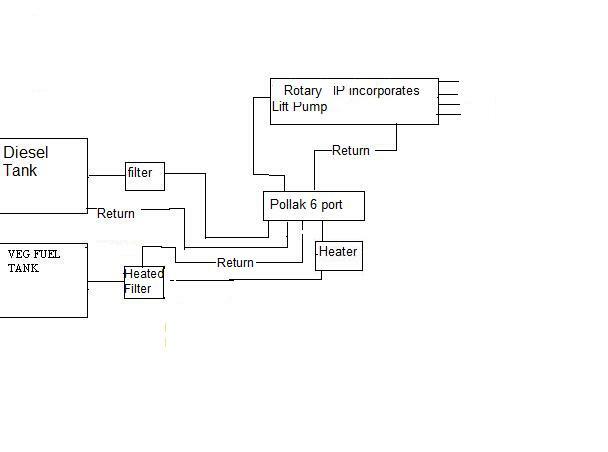 This is a plan of my proposed twin tank setup. I have welded 2 pipe fittings to a 10L jerrican to act as my startup tank. This was stripped, ultrasonically cleaned - the thermostat removed and fitted to the car - it gets VERY hot! I shall see how it performs without a heat exchanger for now. Oh and a good Supply of WVO! i just add 10% petrol, it stops the veg waxing on cold mornings and halfs its viscosity, i have an inline fuel heater just incase but never had to use it as of yet, i use 90%wvo and 10%unleaded. 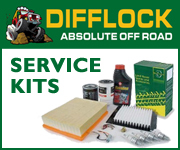 What type of fuel pump does the landy TD engine run? 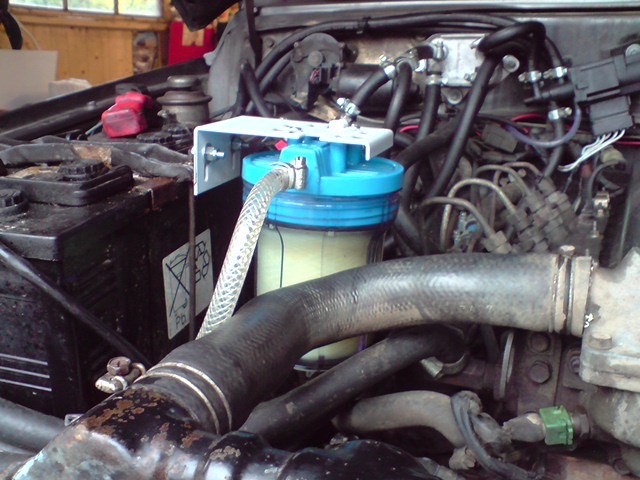 its a 300tdi with bosch pump. i dont mind paying Ã‚Â£2 for 20 litres of fuel. Cold starting is my problem.. hence the twin tank - I like things to be right! Parts are arriving/being made and getting fitted. Diesel tank made from a 10L Jerrican with some fittings welded in, Pressure tested too. 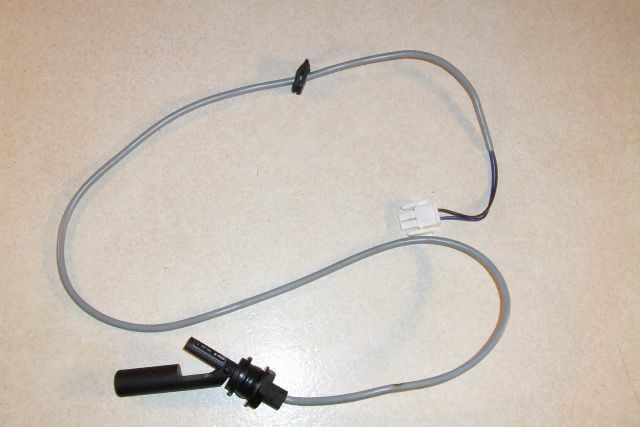 Managed to score a Fuel level sensor from work - I canaged it out of a customers machine because it wouldn't work. Dug it out the other day and swung it around by its wire a clouted it on the desk very hard - it works now! Will fit it to the Jerrican with a warning light on dash. This was the best score, a heated fuel filter from a breakers yard for Ã‚Â£10, Stripped it and put it the ultrasonic cleaner for 10 mins and it is as good as new! Removed the Thermostat and it gets damned hot! Lets hope its not a fake! 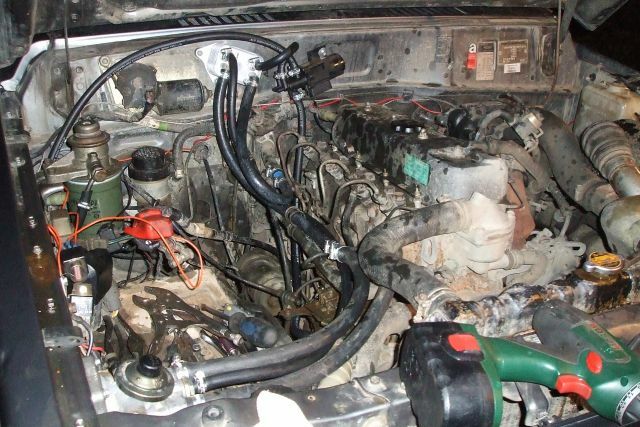 What vehicle was the heated fuel filter from? Diesel Renault Clio I think. Same as this on here. Got the heat ex and the pollak mounted tonight, done all the coolant plumbing and approximately half of the fuel plumbing. Tank fitting in the back and a bit of pollak wiring and she'll be done! Heat exchanger is at a jaunty angle to allow me to use an existing bolt to mount it. so you taking commissions on Discos? You could fit it yourself mate, its dead easy. 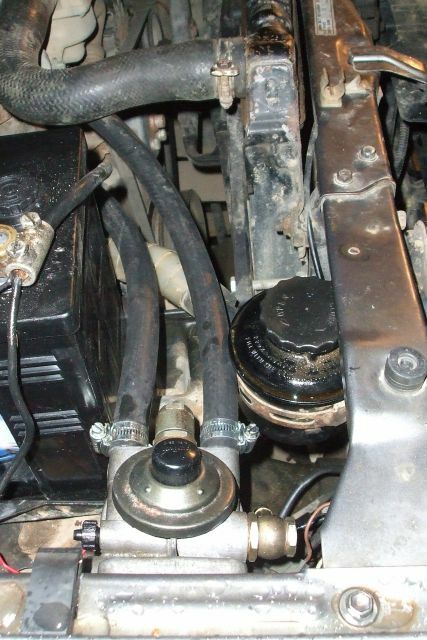 How did you cut into the coolant system for the heated fuel filter and heat exchanger? Is it a case of a couple of T-pieces to the car's heater? I didn't use t peices as I wanted full hot flow so I used the output from the cyl head to the heater pipe and ran it through the filter then the heat exchanger then into the heater. Then I'm sure its getting full flow and gets heat almost as soon as the engine is going as its flowing before the thermostat opens. Hasn't affected my heater either! Just completed the first journey this morn on WVO, smooth as you like, no faults and I even remembered to purge when I got to work! the air temp has a significant effect too. If I'm understanding the basic premise of a twin-tank setup then you need to run on dino-diesel until the engine has warmed sufficiently to then swap over to WVO? 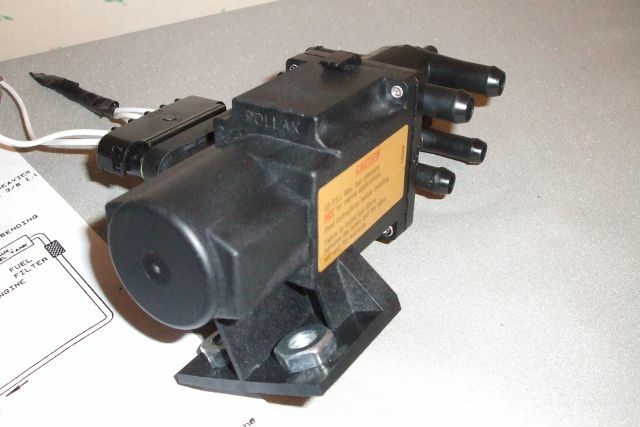 So how about something like an engine block pre-heater like the ones Webasto churn out? Would that not have the same affect, albeit that you'll have to wait for the engine to warm up sufficiently before starting it and Webasto units aren't cheap? Want to play offroad? 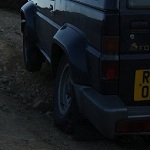 Visit www.paynplay.co.uk to find offroad playsites. The other options are to get an old merc with an Indirect injection engine and an Inline Bosch pump or as you say fit a block pre heater. Renault, my Renault 5 diesel has the same setup (heated filter, not the veg oil, though I'm considering it). Look for Renault Express vans (can't remember what they called them in the UK, but it's the small van based on the R5), R5 diesels (good luck finding one in the UK), older Clio diesels and R19 diesels. Anything that used the 1.6 & 1.9 Renault engines is certain to have this heated filter, and all the plumbing to go with it. If you can't find one, send me a PM and I'll have a look locally, postage and whatever my breaker charges is still going to be a lot less than Ã‚Â£70... or try your local Renault garage, they can probably order you a nice new one. Just take the white plug out the side with an allen key and pull out the black thermostat with its spring then replace the plug, easy! You don't NEED a heated filter - just a Flat Plate heat exchanger, however I like overkill so I got one, twas only a tenner from the breakers. I suspect the heated filter is intended for cold weather, it regularly drops to -15 here in winter, -20 is not unknown. Not much help if your diesel has gelled in the tank (had that happen last winter on a tractor) or for cold starting, but the Renaults do seem to run a bit better than the Citroens and Peugeots (no preheat on the fuel) when it's really cold, provided you can get them started in the first place. Probably not as much of an issue in the UK with generally warmer winters. I found out that the Renault Clio's with this heated filter fitted are fitted with a Lucas fuel pump, this will be why it has a heated filter, because VERY cold diesel can damage a lucas IP, never mind cold Veg! Might make this thread a "Sticky"? Helpful for those twin tanking. 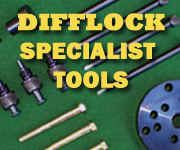 Heated filter is not efficent enough to put much temperature in to the oil, it only keeps itself from plugging at very cold temps and doesn't heat the oil enough to prevent damage to your engine. Posted: Tue Mar 25, 2008 1:01 pm Post subject: 2nd Tank on fourtrak? Just wondering where is the best place to fit a 2nd tank on the fourtrak? Also do you know of any legal issues about carrying diesel in the passenger compartment? I reckon a modified jerry can is the way to go, but i want to fit it in as unobtrusive a place as possible. Great post by the way, i think it has all the info i need. Will be buying one of your filters off ebay as soon as i get all the other bits i need. I would fit your 2nd tank to the roll cage in the rear in place of th Offside folding seat - use a 20l Jerrican - a 10l needs too much topping up for my liking. As far as I'm aware there are no problems with a 2nd fuel tank inside - ideally it should be vented outside but this is more important if its a petrol tank - diesel ain't so bad. i was thinking perhaps trying to fit in a tank into the space just behind the roll bar pillar to the right of the rear seat. there seems to be quite a big cavity there behind the trim, just need to get a jerry can and see if it'll fit. if not perhaps get a custom tank made to fit. the other thing i was wondering is do you think a separate electric lift pump is a good idea, or have you found the IP on the fourtrak to be sufficient? and do you think a heated filter is necessary if i'm using a heat exchanger? 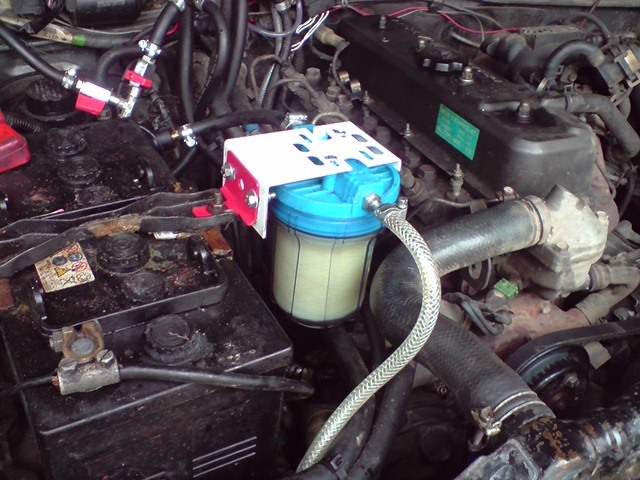 i was also planning to use one of your 5 micron filters as a cold pre-filter before the standard filter and subsequent heat exchanger, as it'll be cheaper to replace your elements than the fourtrak filter (i think i'm going for the ADVANCED setup here http://www.vegetableoildiesel.co.uk/conversionkits.html, and have both valves operated from the same switch). anyone know what the coolant hose id is on the fourtrak f78 (13/16/19mm)? 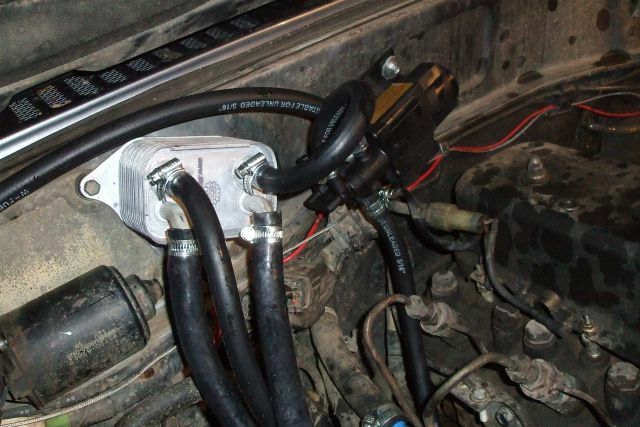 also what's the fuel hose id (8mm/10mm)? don't want to start spilling liquid until i start the conversion!